Thirsty Pilgrim: The Spirit of St. Louis. So is there a limit to the number of craft brewers that locals are willing to support? It's a familiar story in America's craft beer segment -- folks who compete nonetheless helping each other out -- and St. Louis is only one of many places where that story has played out. The numbers, or rather the smallness of them, help explain the phenomenon. But are there cultural factors as well, which might vary in degree from city to city? 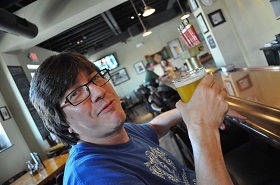 Joe Esser (pictured) is the assistant brewer and cellar manager at Six Row. He's from New Jersey but went to graduate school at Washington University in St. Louis about 20 years ago. He got his master's in literature, so naturally he soon found himself brewing in New Jersey. He returned to St. Louis in October 2010 and started at Six Row, right when the local beer scene was getting ready to pop.